edit 25th of december : AppImage updated following CPU issues. 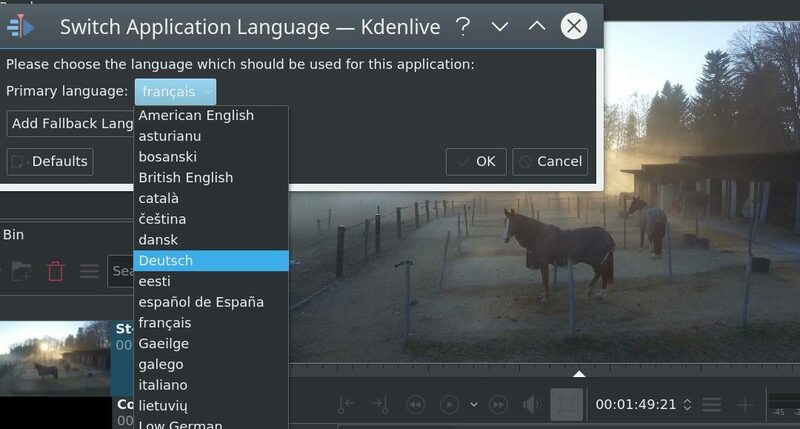 So I wish you all a happy end of year and successful editing… and if you love our work, please consider a donation to KDE’s end of year fundraiser! The Kdenlive 17.12.0c AppImage unfortunately also has some issues with at least the crop, zoom and pan effect when applied to a track. Thanks, Jean-Baptiste! The “d” AppImage fixes the crop, zoom and pan effect for me, so it can be used on my existing and upcoming projects. Have a nice Christmas! I dont’t know if it’s a new issue or not : using the 17.12.d AppImage release it isn’t possible to import an assembled clip (Melt) from the library (my library is not in the default dir). It always fail with “Impossible d’importer des montages de profil différent”. I tried to build a new one with the 17.12.d release, import it to the library and it fails with the same error. Sorry, forget about it, it’s a feature (or so) ! The problem I previously reported seems to come from inconsistent situation after kdenlive Appimage crashed… The mount in temp dir was still there (with a dead process attached). Then new instances were unable to locate library (complaining about libSDLxxx)… killing the dead process, umounting the temp dir and restarting new kdenlive solved everything. Thank you guys, you are a awesome group of people! I wish that I knew programming so that I could be a part of it. Maybe some day, hopefully. Anyway, just wanted to spread some love and say thanks! By the way, on flathub.org there is an application kdenlive.flatpak !!!. Can you support it or in the downloads section of kdenlive, add a link redirecting to flathub? Please enlighten; I don’t know what you mean and what your operating system is, you’re not giving any details, so I can only guess. Did you, per chance, download the AppImage for Linux file? Then you must not “unzip” it. Instead make it executable using your favorite desktop environment; on KDE, right click on downloaded file, choose “properties”, second tab, tick “executable”, “Ok”. Now (double) click on the AppImage to start it. Stop! Go to our downloads page https://kdenlive.org/en/download/ and follow the instructions there.